Oh, and it costs just 240 Microsoft Points ($3) and is available now on the the Xbox Live Indies Game service. 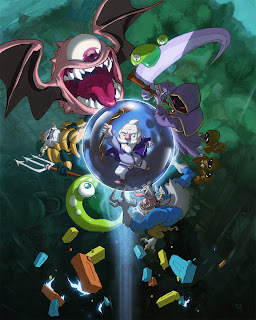 Not only is Wizorb--which was made by Justin Cyr, Jonathan Lavigne and Jean-François Major (who recently joined forces to form Tribute Games)--look, sound and play like a dream, but it's backed by a silly story, too. Here's the gist of it, in case you're curious: The once-peaceful Kingdom of Gorudo is threatened by an evil presence. The only hope for salvation is Cyrus, a wizard versed in a secret magic art called Wizorb! Wizorb is more than a Breakout clone covered with a cute, somewhat-clichéd, RPG-ish coat of paint, by the way. For starters, there are boss battles. Also, Cyrus' can call on magic spells that affect his "magic wand" (aka his Arkanoid-ish paddle) and/or the stage that surrounds it. Finally, keys can be collected and then used to unlock doors--which lead to bonus items and even Zelda-esque shops--that are located at the back of certain levels. As cool as I'm guessing that sounds in theory, I can guarantee--after spending a good amount of time with the game last night--that it's even cooler in practice. Honestly, if this were a boxed-and-available-at-retail Genesis/Mega Drive title, I'd pick it up in a heartbeat regardless of the price tag affixed to it. It's that beautiful, charming and fun. I have to check it out. Love that artwork! Oh, and, yes, I keep forgetting about Paul Robertson's contribution. Sorry, Paul :( He definitely deserves recognition, by the way -- the game's animations are superb! I don't care what system it's for; if it were made available to anything I owned I'd buy it. Well, it'll be released for PC soon, Justin, so that's good. I wonder if it'll hit the Mac, too -- or maybe other services/systems?